Far south of the Imperial City. The Western Elsweyr Gate is a border keep in southern Cyrodiil, far south of the Imperial City. It is controlled by the Aldmeri Dominion. 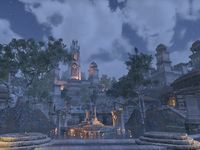 It is connected via the Transitus Network to Castle Black Boot, Castle Brindle, and the Eastern Elsweyr Gate. It is one of the two main bases of operation for the Dominion. This gate can be seen (but not entered) from the other side, just southeast of Fort Sphinxmoth in Reaper's March.